SK Electric has built a reputation for top-rated residential electrical services for nearly 20 years. 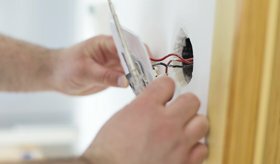 Electrical issues can be intimidating, but working with our highly skilled contractors can help you make informed decisions about the best electrical solution for you. Our customers are our number one priority, which is why we’re available 24 hours a day and offer same-day service for your convenience. No matter what electrical services you require, SK Electric has the power to help you reach your goals. Contact us today to learn more.